"3 Times every week - The Washington Lotto from the WA State Lottery"
The Washington Lottery was formed in 1982 with a remit to generate some very welcome income for various state programs via monies it would raise from sales of its lottery tickets & is run by the government of the state of Washington. In addition to this – the Washington State Lottery is an active participant in causes that help to raise awareness about the risks that are apparent due to problem gambling. Washington State Lottery – along with others – is a valuable partner of the Washington State Patrol and helps support the Amber Alert Program across the state of Washington. The Amber Alert Program receives reports of missing or abducted children with the assistance and cooperation of lottery retailers and broadcasts this important information to the public. As well as this – the Washington State Lotto partners with Page Ahead – a not-for-profit group that supports literacy at home for low-income families with children by providing donations of books. The WA State Lottery is a member of the Multi-State Lottery Association (MUSL) that operate the huge Mega Millions lottery and offers MegaMillions as part of its overall portfolio of games. The Washington State Lotto is the main game in the Washington State Lottery product range. It is a traditional draw type, jackpot style game introduced by the WA Lottery back in July 1984. 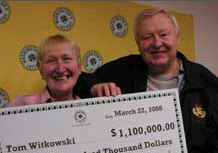 Jackpots for the Washington Lotto begin at US$ 1 MILLION and rollover each time they are not won. The resulting increase is then added onto the following draw’s jackpot which rises in size every game until somebody eventually wins the top prize. It will then revert to the starting jackpot sum of US$ 1 MILLION once again. The size of the lotto jackpot rollover increases are dependent upon the number of lottery ticket sales – the more people who play and the more lottery ticket sales – the bigger the rollover jackpot. The Washington Lotto uses a single matrix configuration of 6/49. Draws for the Washington State Lotto take place three times per week on Monday, Wednesday & Saturday at 8pm Pacific Time. The WA State Lottery Lotto uses what’s called a 6/49 matrix for its Lotto game – which means that when you play the Washington Lotto you need to select 6 numbers out of a range of numbers from 1 to 49 – if you match all 6 of the lotto numbers drawn then you will win the Washington Lotto jackpot prize. In addition to the jackpot itself – there are 3 more ways in which you can win this WA State Lottery – with prizes to be won on the Lotto if you correctly match 5 of the 6 winning numbers drawn, 4 of the winning numbers or even just 3. A Quick Pick facility is available when playing the Washington Lotto very much the same as the Lucky Dip option that is used in the UK National Lottery or Europe’s EuroMillions or many other USA Lottery games – meaning that you can ask your computer or retailer to randomly pick your Washington Lotto numbers for you. When playing the Washington Lotto you will need to select 2 sets of 6 numbers as you will receive 2 entries every time you play. So – playing the Washington Lotto is simple – just choose your own sets of 6 numbers or use the random number generator Quick Pick option to have them automatically selected for you. The cost of entry into the WA State Lottery – Lotto – US$ 1.00 and for this you get 2 separate plays meaning 2 chances of winning. Washington State Lotto – Who Can Play? 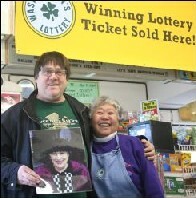 As with most USA Lottery games – previously only citizens living in the State of Washington were allowed to play in any of the Washington Lottery games including Washington Lotto – you used to have to purchase your WA Lotto tickets from an authorized lottery retailer based in Washington. Nowadays though – there are a good number of online lottery ticket sales agencies such as TheLotter who are both authorized and accredited – you are easily able to select your Washington Lottery numbers online and purchase your lottery tickets without being concerned about what part of the world you may be living in. This is great news of course if you live outside of Washington & the USA but still wish to play the Washington Lotto & ensure your entry into the next drawing or just want to have the convenience & ease of being able to buy lottery tickets online for the WA Lotto. Once you have entered into the Washington Lotto draw – you can then easily check the latest Washington Lottery results online to see if you have become one of the Washington Lottery winners. You will need to be 18 years of age to be eligible to purchase a ticket for a WA State Lottery game including the Washington Lotto.